Most people don’t think twice about what happens to an email after they press send. Emails seem to appear instantly, but the reality is they often have long and indirect journeys through thousands of miles of cables – and a new program has been designed to help people visualise this arduous journey. Dubbed Email Miles, the email plug-in uses GPS technology and internet tracking to log where a message was sent and where it was received. It then calculates the total distance between the two and displays it on a monitor. When an email is sent, the location of the server sending the message is tagged into the code of the mail. Email Miles scans an email for this so-called Geolocation tag. Every time an email is received by a new server, the new location tag is added to the email. Brucker-Cohen’s plug-in tracks the different server locations of the emails and calculates the distance, in miles, between the two using GPS co-ordinates. Inventor Jonah Brucker-Cohen hopes the program will ensure users do not take for granted how quickly we can communicate with one another in the modern world. ‘Information is ubiquitous, but the speed and transmission of this information is typically invisible to people who have no conception of the infrastructure involved,’ he added. ‘The project looks to make those physical locations and separations more tangible and thus to change how people perceive their online communications,’ he went on to say. One of the program’s more interesting revelations is how indirect the route of many emails can be. 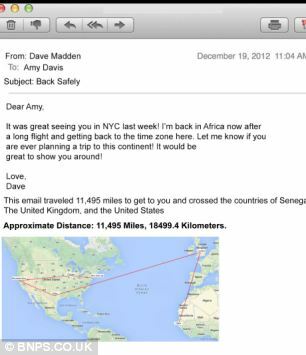 For example, an email sent from New York to Dakar in Senegal travelled a total of 12,115 miles – much further than the actual distance between the two cities. This is because the email first travelled 790 miles west to Chicago, then another 2,163 miles west to Mountain View in California. After that it finally started making its way back east – first 1,699 miles to Dallas, then 4,745 miles to London, before eventually heading 2,718 miles south into the West African city. The nature of email and web traffic means that for emails to travel long distances, it sometimes has to be passed through different servers as it enters and leaves different countries. This is because different companies manage different network cables. Brucker-Cohen claims the program does all of its time and distance calculations using the internet and a coordinate mapping system. ‘Email Miles is beneficial because it adds a physical component to a phenomenon like email that is perceived as purely virtual,’ he said. Brucker-Cohen has set up a FundAnthing campaign to raise money to make the plug-in widely available.